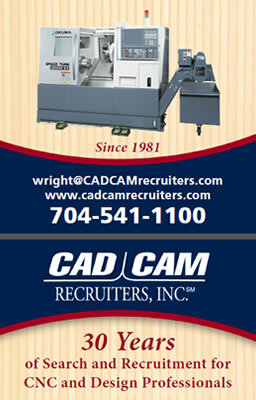 CAD/CAM RECRUITERS, Inc. primary thrust since 1981 has been the direct/permanent placement of CNC Manufacturing and Design Professionals. We have helped client companies from Medical device to Aerospace and Injection Molds to Blade and Vanes. We have helped our clients get the right individual for 30 years. Relocation assistance is provided.